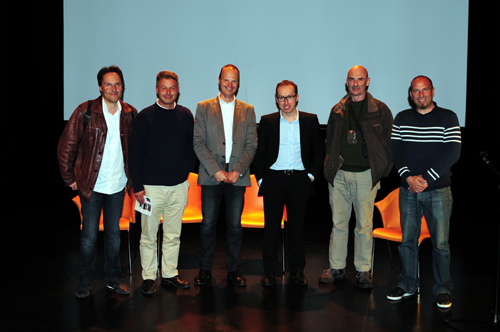 On wednesday, June 4 2014, in Darnetal (76), in the théâtre de l'Echo du Robec, took place a special public preview with the screening of the Alban Vian's documentary « Les Fantômes de la Manche » (« Ghosts of the Channel »). This remarkable documentary, co-produced by C-3D Convergence images and France Télévisions with support from the CNC and the Basse-Normandie Region, received a warm welcome from an knowledgeable audience who has discovered, for 52 minutes, a little-known page of History : offensive operations led by the U-Boote after the Allied landing on June 6. Combining History, human relations and underwater adventure, « Les Fantômes de la Manche » revealed to the spectators various facets of this crucial period of the Second World War. Were present Alban Vian, director-producer, Stéphane Gaillard, France 3 Haute-Normandie regional representative, personalities from the audiovisual, arts and culture worlds, as well as Luc and Mark Braeuer, historians and military museums curators, and Jean Louis Maurette, representing l'Expédition Scyllias who participated in the filming and brought his expertise in the field of U-Boote and their wrecks. After this projection, a cocktail given by champagnes Dom Caudron allowed spectators and stakeholders who participated in the filming to exchange in an friendly, passionate atmosphere. This followed the journeys from 2012 to 2014 in Germany and then in Normandy and BSM Brest. in Germany then in Normandy and in Brest submarine base. 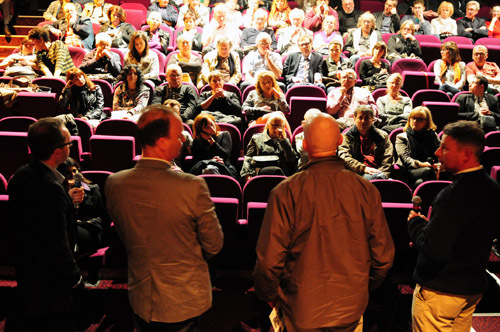 The documentary, highly acclaimed, has been broadcasted twice : on June 14, on France 3 Haute-, Basse-Normandy and Brittany channel, and on June 16, on France 3 Ile-de-France, Centre channel. Press the F key on your keyboard to switch to full screen (and Esc to return to the website).